When it comes to superheroes, super villains, and the various actors who inhabit them, it is becoming fairly common place for online petitions to rise up, as various famous faces lobby to play their favorite comic book characters. Anna Kendrick recently made headlines with her wish to play Squirrel Girl for Marvel, various action legend have thrown their hat in the ring to play Cable in Deadpool 2, and now someone has come forward with prayers to play the recently announced Aquaman villain Black Manta. That someone is Michael K. Williams! Which sounds like a perfect choice. The actor is perhaps best known for playing Chalky White in Boardwalk Empire and he was last seen in this summer's Ghostbuster remake. Now, he's taking to Twitter with a personal prayer to God that he'll be cast in this impending DC Comics adventure to be directed by James Wan. He exclaimed the following on Twitter. "Lets go! 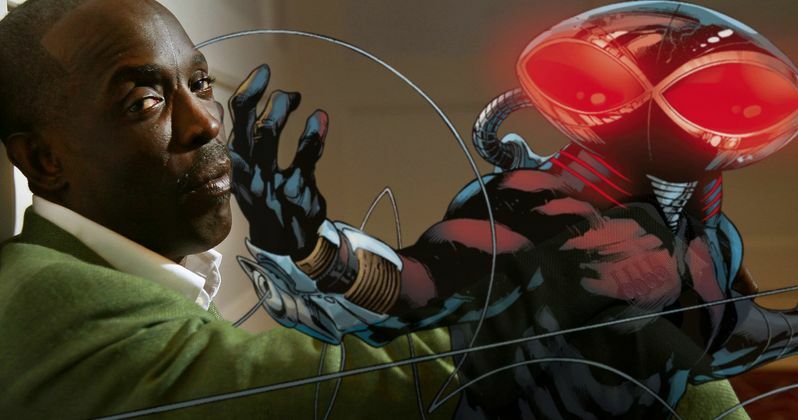 !RT @tommybIakes: Dear god please make it so that @BKBMG as Black Manta in the Aquaman movie." At this time, there is no mention as to who might play Black Manta. The character has a dark backstory, and is one of Aquaman's more classic villains. He first appeared in Aquaman #35 in September 1967. Black Manta is a man with enhanced strength and abilities, who wants to challenge Aquaman to rule the sea. He wears a high-tech suit that allows him to be under water, and often shows off various weapons. There are a few different origin stories for Manta. In the 1993 origin, he is kidnapped as a boy and forced to work on a ship, while also being sexually abused by his captors. He eventually kills one of his captors in order to escape. At one point, Manta tries to signal Aquaman for help, but the King of Atlantis doesn't see him, and doesn't come to the rescue, which sparks a deep hatred for the superhero inside of this super villain that fuels his motivaion for a lifetime. The origin changed in 2003, though is as dark, if not more so. In this version, the nameless boy who eventually becomes Black Manta is an autistic orphan, who winds up in Arkham Asylum. The boy is experimented on and becomes incredibly violent. He kills the scientist who gave him the treatment and escapes. As a boy, prior to his stay at the asylum, he had a fascination with Aquaman, and is very comfortable in cold water. He feels excruciating pain under cotton sheets. At Arkham, his caretakers would strap him to his bed, forcing him under cotton, making sure it surrounded him at all times. In related news director James Wan has explained how he plans to handle the underwater dialogue scenes. At the time, the filmmaker teased that the movie will use speech bubbles. But he appears to be joking. He states the following. "Speech bubbles, right?! Maybe it'll be speech bubbles. [Laughs] I never thought about that...Words come out of the bubbles. It's brilliant! That's a cool visual. It would be very literal! No, here's the thing I always say, if you have water in your lungs, like these characters do, there's no air bubble. So I don't know...I just think in my movie, I want to kind of create...I love the idea of underwater speaking but with a real sort of sonic, aquatic quality to it. So there's this sort of aquatic, almost sonar/whale thing. Even though it's in a human language, there's this slight sort of underlay to it, this ping to it, which I think would be interesting for us to design from a sound design perspective. It will be fun. Also, Zack has some ideas that he'll be doing in Justice League. I'll be honest, in some ways, JL will be an experiment for me to see what works and what may not work as well. And then kind of go, okay...Here's the great thing, with all these superhero movies, you watch from one movie to another, and they always sort of slightly change things along the way. You kind of have to do that to make what's best for your film." At this stage in the game, it sounds like a lot of stuff is still being ironed out in terms of Aquaman and how the underwater scenes will actually play out. The movie is expected in theaters July 27, 2018, but as we've seen in the recent past, that is subject to change. It was just announced yesterday that main star Jason Momoa has all but signed onto play Eric Draven in the long-awaited The Crow remake, which will actually happen before Aquaman. As far as the DC Films universe is concerned, Wonder Woman is locked in for a June 2, 2017 debut, with Justice League, which is shooting now in London, set for its big premiere on November 17, 2017. Here are the tweets from Michael K. Williams and James Wan, who clarifies earlier statements that Aquaman will be the Wolverine of Justice League.